Romantic Grade II listed cottage in arguably the prettiest chocolate box town in the Cotswolds, Bourton On The Water . Captain's Cabin has one private parking space for a mid sized car directly in front of the cottage. Check in time 3pm and check out 10am. Tassimo coffee maker and Bluetooth mobile speaker. New SMART TV installed April 2018. Bourton is around 40 minutes from Oxford and is centrally located for visiting other Cotswold villages such as Chipping Norton, Burford, The Slaughters,Chipping Camden, Moreton in Marsh and Broadway. This cosy cottage boasts plenty of traditional charm with characteristic features. Set on three floors the property has exposed beams , reclaimed and restored oak flooring downstairs with huge inglenook fireplace, exposed honey coloured Cotswold stone walls but with on demand central heating and dual fuel traditional log burner for those cosy evenings . NOTE: There is one central beam on the ground floor height being 5'7 which is the lowest beam in the cottage. Full free internet access and Smart TV with all amenities and dining table and chairs for three. Ground floor houses main living area and kitchen. First floor has a very pretty and romantic double bedroom which has a Grade II status stone mullion window as center piece and good size full height triple cupboard. Also on first floor is a modern bathroom housing bath, shower over bath, dual towel rail radiator and vanity units with touch free LED mirror, basin & toilet. 2nd floor takes you to the single bedroom which has views over the rooftops and rolling hills beyond. There is a patio area to the front with seating for two which is a sunspot each afternoon in the Summer months or al fresco dining. To the back of the property you can access footpaths via a pretty lane and historic church graveyard. The footpaths can take you to the Slaughters which are particulaly beautiful.Town center is at the end of the drive! where you can picnic along the River Windrush in the Summer months or have a cream tea in one of the many quaint tea shops or even a pastie from a boutique pastie shop opened in 2017. Several restaurants offer a mixture of cuisine all within less than 2 minutes walk. Despite the bustle of the town all you can hear is the birds as you relax with a hot drink or glass of champagne in the courtyard. Many of our guests have commented on the fact the cottage is secluded but is a few steps away from the town center. Check out the history of Captains Cabin from search engines to find out more about this and the adjoining set of quaint cottages , part of which is said dates back to medieval times set off the main road. Property is set over 57 sq m or 613 sq feet. One small well behaved pet is allowed but please contact us first. I purchased this property in April 2014 as a future retirement property for my wife and I at some point in the future. The cottage was renovated using local specialised builders to ensure the building is in keeping with it's character. I want to ensure that the cottage can be a haven for couples or walkers or those with a young child and that it has all the essentials needed for a worry free, enjoyable time away from work. This town is my wife's favourite town in the Cotswolds (hence our 'joint' decision to purchase a holiday home here). 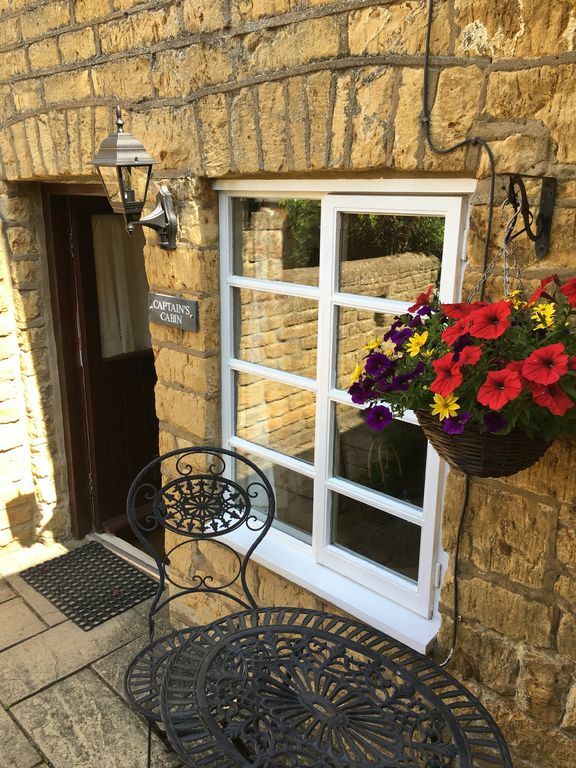 The cottage is so well situated which is another reason we appreciate the proximity to Bourton but also the sun trap courtyard. Even our cleaner sometimes eats her lunch there and cant tear herself away! Despite Bourton being busy in the Summer months, the cottage offers a secluded (and quiet) place to relax and enjoy. We immediately fell in love with the property and have renovated it appropriately sourcing as much as we could locally and using local tradespeople. An evening meal can be enjoyed in Bourton and you can be back in the cottage within a couple of minutes without the need for a car which we also love. What a shame we have to work so don't get to enjoy it enough - roll on retirement! We think the property is arguably set in one of the best locations in the village. Set just behind the shops and a couple of other cottages and a PARKING space directly in front of the cottage which is sometimes difficult to source in one of the most popular towns in the Cotswolds. I don't think I have ever seen such a large inglenook fireplace in other cottages which is an amazing feature and the 1st floor bedroom with its beams and cream cupboards and honey exposed stone is really nice to wake up to each morning. Directly behind the cottage you can access public footpaths to Lower Slaughter or beyond. What makes Captains Cabin unique is its comfy seating and cosy atmosphere. It is simply very enchanting and many guests are sad to leave after their stay. Steeped in history the cottage is part of a small group that dates back to medieval times. Captains Cabin is the only cottage in the row that hasn't had additions or major alterations . The mullion window to the front of the property gives it the Grade II status and is a focal point in the double bedroom. Slimline dishwasher , electric hob and cooker , double toaster, kettle and Tassimo coffee maker. Mobile Bluetooth speaker , play your own tunes! Notes on accommodation: Please note the cottage has a low beam downstairs (5ft 7) and access to the top single attic room would be difficult for elderly visitors or under 5s. Outside: To the front is a secluded courtyard, catches the sun in the Summer months from about noon until late, with wrought iron table and two chairs. Cleaning / Towels / Linen : Property is cleaned at each changeover, towels and linen are provided and cleaned at each changeover. Please adhere to check in and check out times to ensure any issues can be sorted between changeover. Thank you for your review and so pleased you enjoyed the local walks. Please do visit us again! We really enjoyed our stay at this lovely old cottage full of character. It was warm and comfortable just perfect for short break.Great location in the centre of the village but down a quiet lane. Excellent walks from here to the surrounding areas plenty to see and do. We will definitely return and would thoroughly recommend. Thank you so much for your kind words. Captain’s Cabin is indeed perfectly located for either local walks along the River Windrush or indeed a stroll to Lower slaughter for a pub lunch , so pleased you enjoyed your stay and please do visit us again! We had a lovely stay at Captain's Cabin. It is very cosy and in the perfect location of Bourton on the Water. We had everything we needed. Nice touch to have tea/coffee, milk and wine awaiting us. Thank you so much for your lovely comments , we also agree it is very cosy in the winter months and glad you liked the welcome pack. Please do visit again. Property was cute and cozy. Great little get away. Running my own business means I try to take a few short breaks. I would encourage anyone who is looking for a little reset to go to Bourton on the water. Very nice for walks, pubs and have a bit of downtime. Very relaxing and would go back A+. Thank you so much for your review . The cottage and surrounding area do transport you into a relaxing environment for busy working people it brings much needed respite! Please do come again. Had a fabulous stay. The cottage was lovely with everything you may need. Bed very comfortable. Would definitely return. Thank you so much for your lovely review, glad you enjoyed the cosiness of the cottage please visit us again! Wonderful stay at Captains Cabin... spotlessly clean, comfortable and right in the middle of Bourton, but off the main road so also very quiet. Welcome bottle of wine very much appreciated! Thank you so much for your lovely review and so pleased you enjoyed the comfort and cosiness of our cottage. Please do visit us again! Use of a car is recommended. Oxford is but 40 minutes away but many local villages outside of Bourton can be reached in less than 15 minutes. The Cotswolds are just under 2 hours drive from North London. Alternativly the number 801 bus stops right outside Rectory Lane which is 15 seconds walk from the cottage. 801 bus takes you to Moreton where you can catch overground trains to pretty much anywhere. AVIS Rentacar also in Moreton. You need to pre book and it can only be returned to Moreton . Oxford is 40 minutes away, Chipping Norton, Morton in the Marsh,Burford,Stow On The Wold and many more all within 15 minutes by car. Cheltenham has the same stores as any major London shopping centre and is 32 minutes away in a car from the cottage. There are also many bistro eateries plus theatres . Booking Notes: Deposit required within 48 hours of quote being sent. Deposit is 25% of total cost with balance required within 45 days of visit. If booking under 45 days then full balance is required. Refundable Damage deposit also required at the higher of either £50 or 20% of full quote.Please note minimum 3 night stay low season and minimum one week stay July/August and Christmas Changeover Day: Preferred changeover day is Saturday during Summer holidays. Flexible at other times. Note minimum 3 night stay low season and 7 night stay high season. Very rarely we may offer a 2 night stay but this would be at a premium to account for fixed costs.